Another month roles by and we are now back looking at cutting grass and pruning the climbers etc. 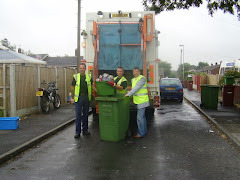 I know that the recycling figures for the district have dropped over the Xmas and new year period but like us I am sure it will all pick back up again now that we are back on the regular recyclate and garden waste collections. I am quite pleased with the way things are going in the Hudson household although there is still far too much plastic coming in the form of packaging. I am definetly getting ready to unload all the packaging at a checkout because I do not see why I should be burdened with the problem of getting rid if unwanted packaging. More on that one in the next post I think?